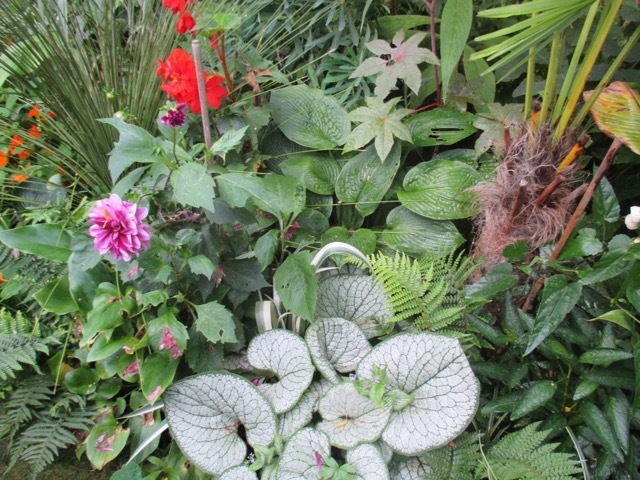 Buying tender plants at the height of summer is so easy, when the ice and snow of winter are but a dim and distant memory. 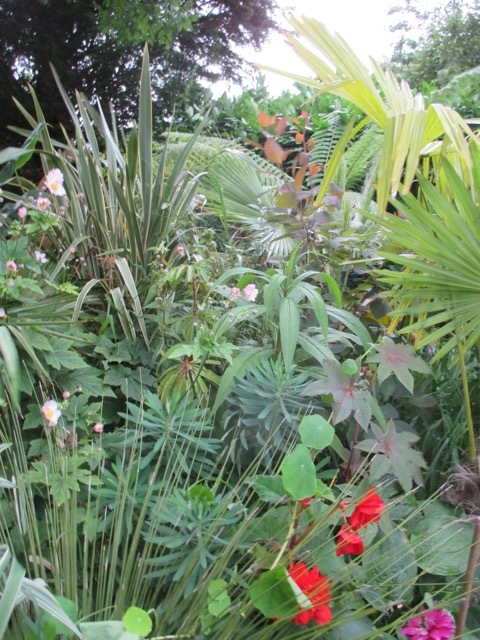 It is easy to get carried away and buy far too many, far too large plants. I know. I am that person. 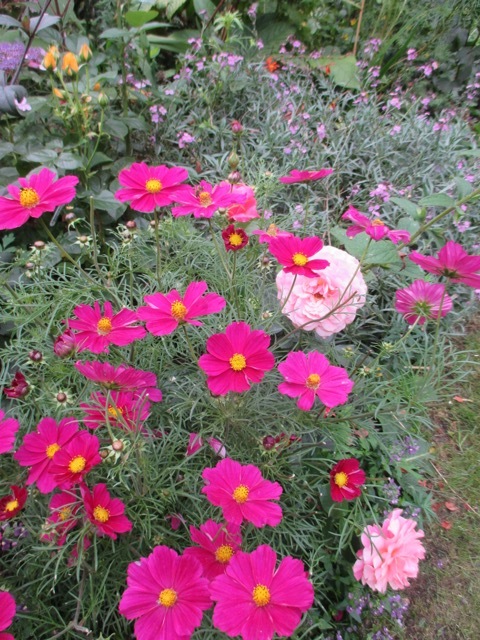 However, once the temperature drops, they all need to be kept snug and frost free, if they are to survive until spring. I have been struggling to find the best way to do this for years, and, believe me, there have been many casualties along the way! 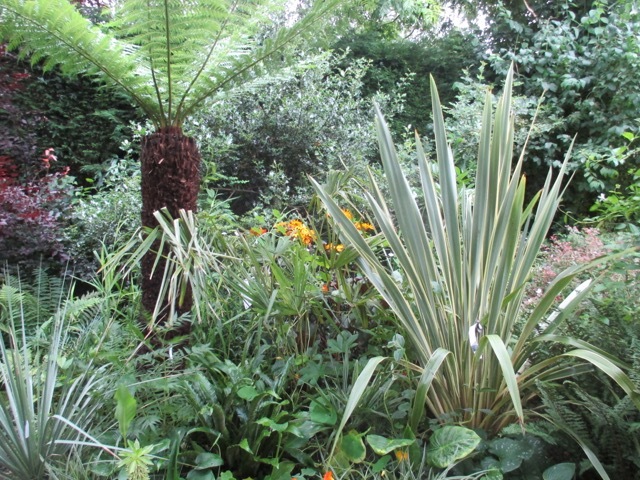 As an inexperienced gardener I tried the 'ostrich' approach, which meant that I stuck my head firmly in the sand and ignored all dire warnings on plant labels. I basically just left tender plants outside throughout the winter, and they died in their droves. I then progressed to wrapping them in fleece, which, although better than nothing, only gave minimal protection of a couple of degrees at most. 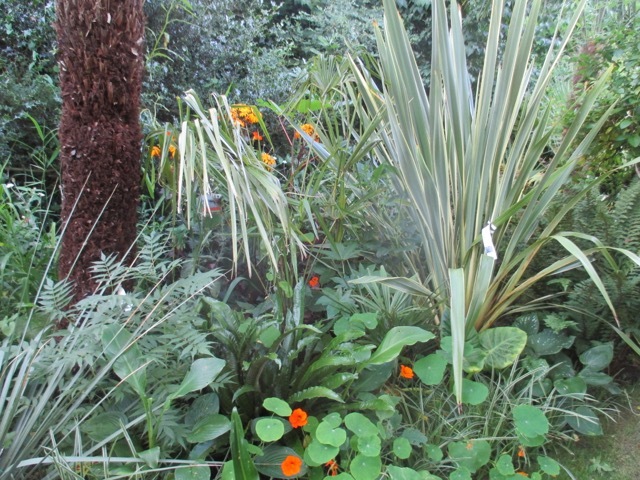 Real divas just disregarded it and still died, although it really did help the borderline frost hardy plants. 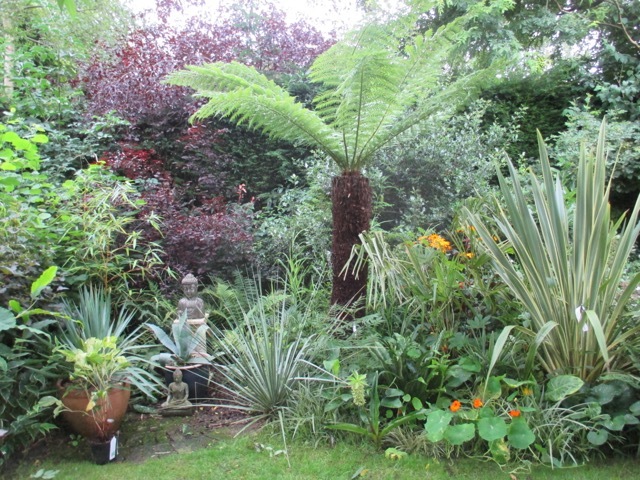 Wrapping most palms gets them through cold weather, and stuffing tree fern crowns with straw seems to do the trick, but it is finding the solution for the really tender stuff which causes the problems. 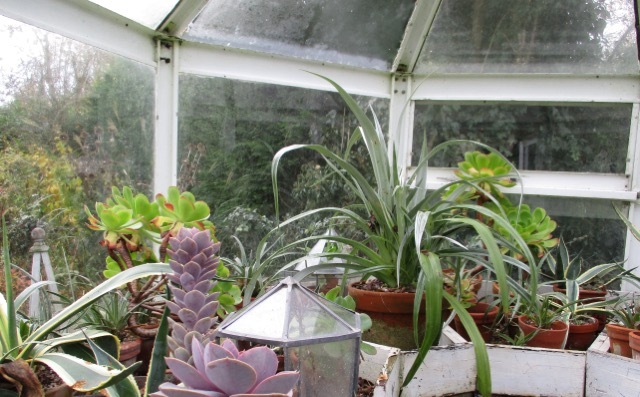 Getting a greenhouse was the first real step towards raising the survival rate of the delicate plants, but an unheated space is not necessarily frost free, as I found to my cost. Initially, I tried a paraffin heater but found it to be totally ineffective in the space, and impractical to use, as it is dependent upon you being there to light it. 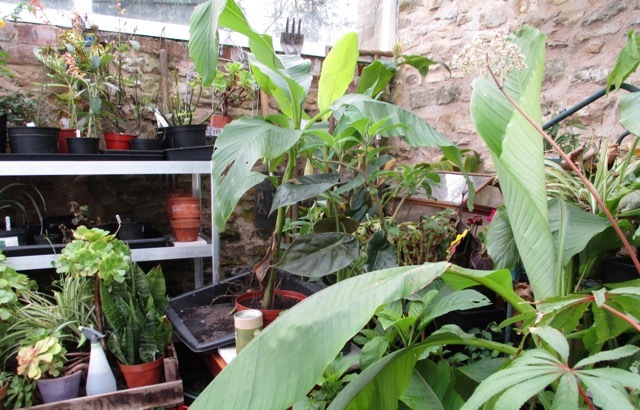 The conservatory (which is heated) has been my saviour for the last ten years or so, and plants usually jostle together for space in there. 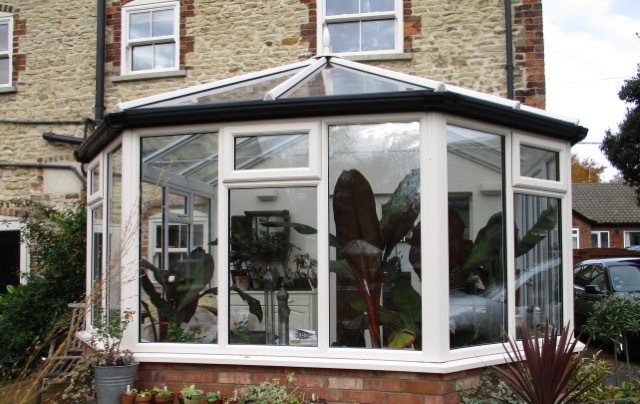 It is a great solution for the plants, but not for the humans, as it virtually decommissions the conservatory from any other purpose other than that of a greenhouse for almost half of each year. This year I decided to get the job done properly and to get electricity out to the greenhouse, so that I could have effective heating installed. Once that was in place I looked around for a good greenhouse heater, and researched online for recommendations. They say you have to kiss a lot of frogs before you find a prince, and, although not as enjoyable, I think the same may be true of greenhouse heaters ! I tried a 2 kw electric fan heater, first, as sold by 'Two Wests and Elliot'. Rightly or wrongly I trust them as a company, and so felt confident in buying a heater from their website. 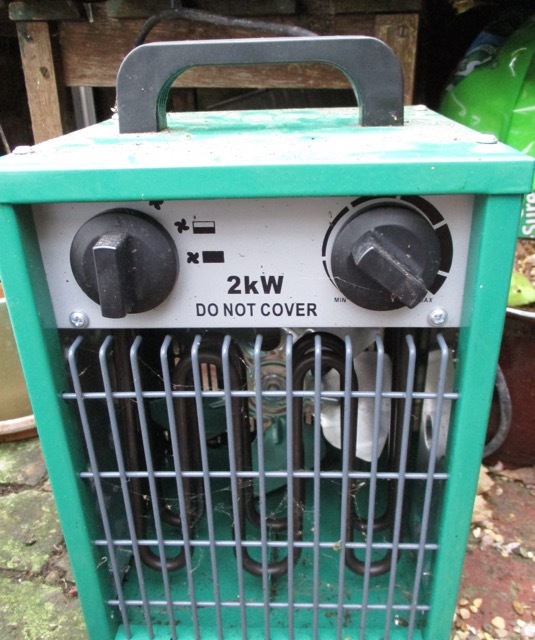 The heater, itself, was actually fine, but I hadn't done enough homework, and had bought a heater which was just too small to heat the area of the greenhouse. Big fail. Back to the internet, and I found a beast of a thing which would do the job - a powerful electric heater capable of heating the Albert Hall. Trouble was, when I asked the advice of Jim, our electrician, he just burst out laughing - never a good sign! To run it, he pointed out, would need a whole new armoured cable, as it was so powerful - and it would also cost a fortune to use. 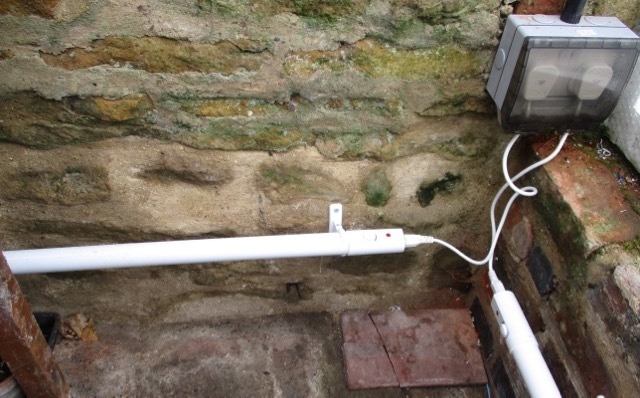 Jim suggested heating tubes, which are cheap to buy and to run and could be installed on the current system. He duly installed three tube heaters, to heat the entire space, and cleverly linked them to a thermostat, so that they come on automatically when the inside temperature drops below about 6 degrees. So far they have been very effective and the temperature has not dropped below 5. 2 degrees, even though there have been some cold nights. I have a max/ min thermometer, so that I can check the range every day, and monitor it carefully. 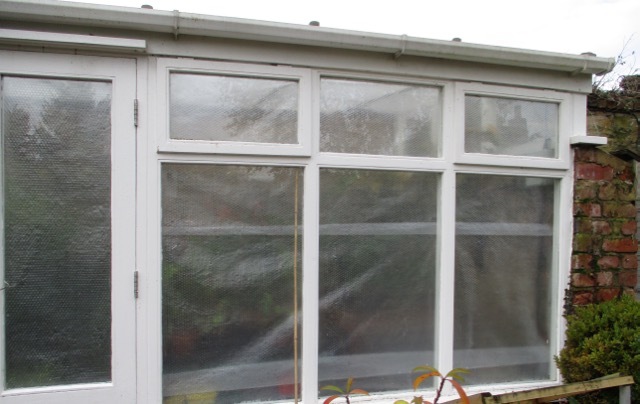 Although I know, in theory, that insulating a greenhouse makes a huge difference, it has taken several years for this fact to goad me into taking action! This year we have put up horticultural grade bubble wrap across windows and glass roof, and it makes a noticeable difference. 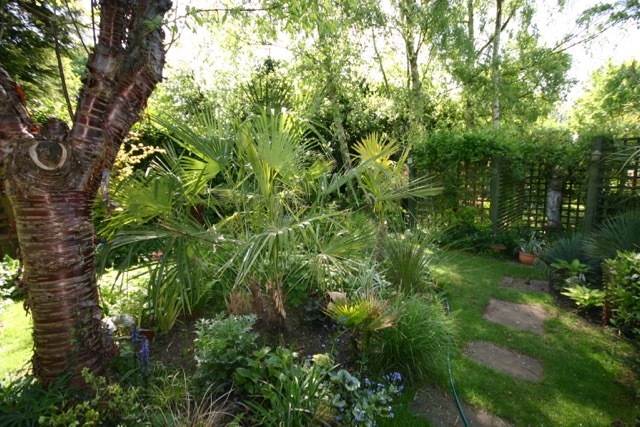 It has to be horticultural grade to allow uv light in, I believe. 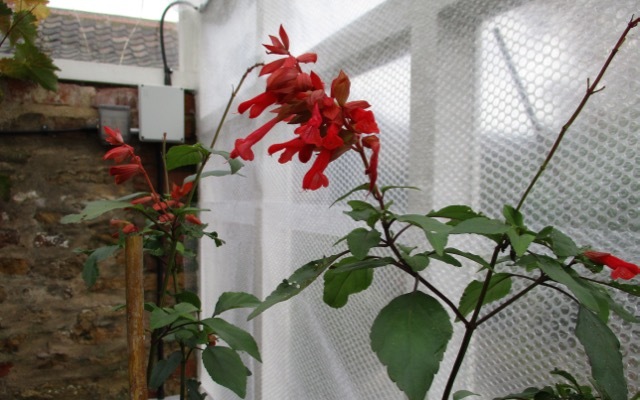 Ventilation is always an issue in a heated greenhouse, and it seems contra-intuitive to heat a space, then open a window, but moisture is the biggest danger, as it can cause mould, rot and all manner of unpleasant things. Insulation serves to hinder the free circulation of air even further, and can compound problems with moisture. I try to open the doors when the weather is mild, to get as much air circulating as possible. 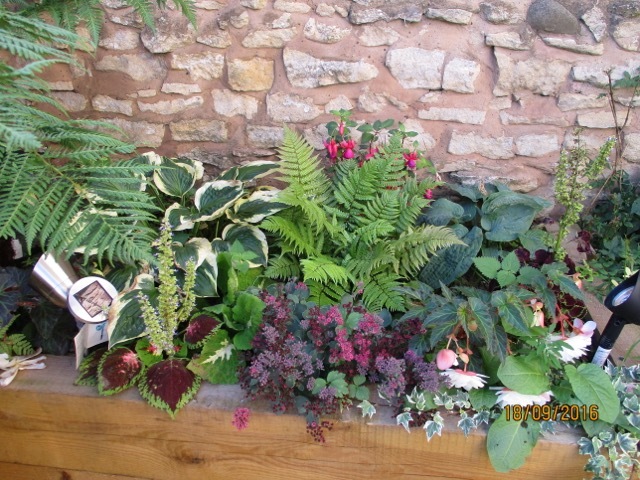 Plants are checked regularly and dying flowers and foliage removed. Everything is kept as dry as possible, as this makes a huge difference to survival rates. 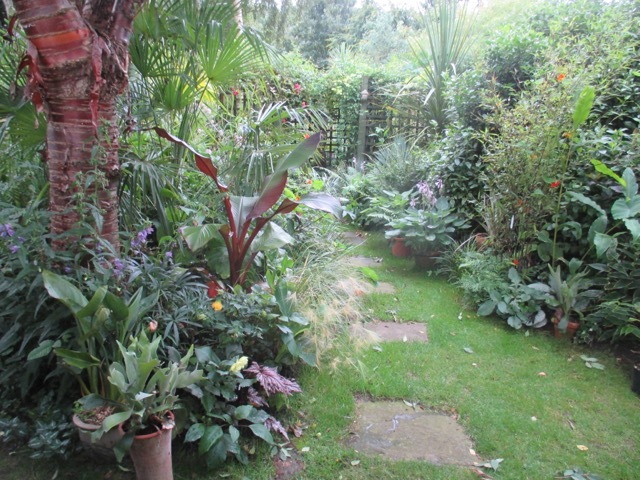 I barely water at all, and only give plants a little drink when they are starting to droop. 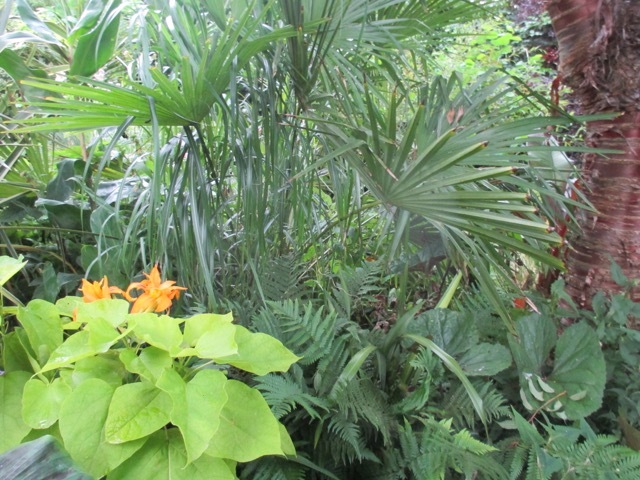 Precious things have joined us in the conservatory, and I have brought in young seedling, like Tetrapanax, and put them on the windowsill, along with cuttings of favourites such as Abutilons and salvias. 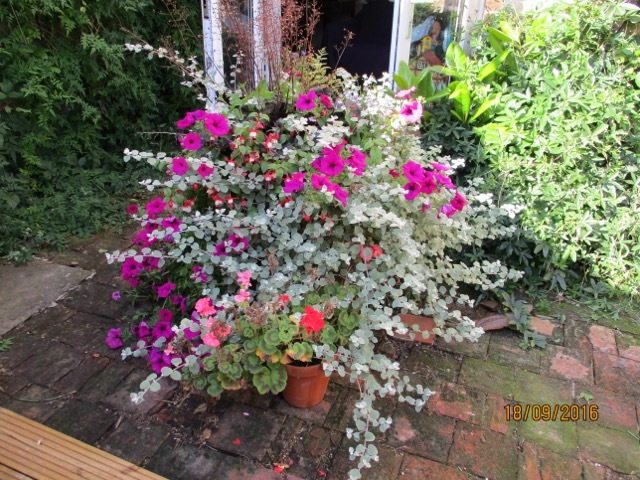 In this way I hope to ensure I still keep some for next season, even if it all goes pear - shaped in the greenhouse. 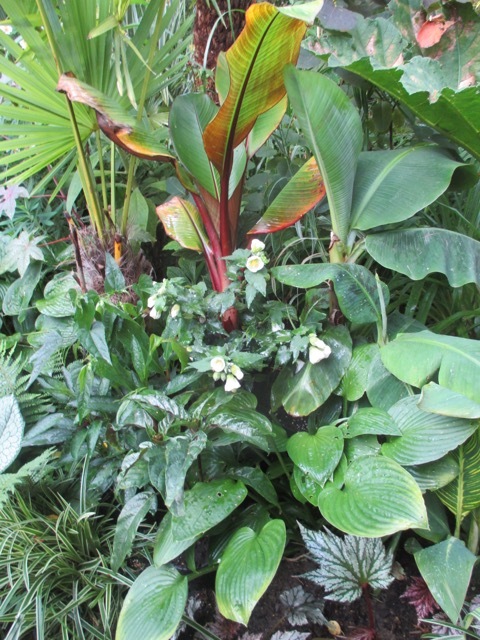 The big Ensete Ventricosum Maureliis are all snuggled up inside, as are some abutilons, which are still flowering. 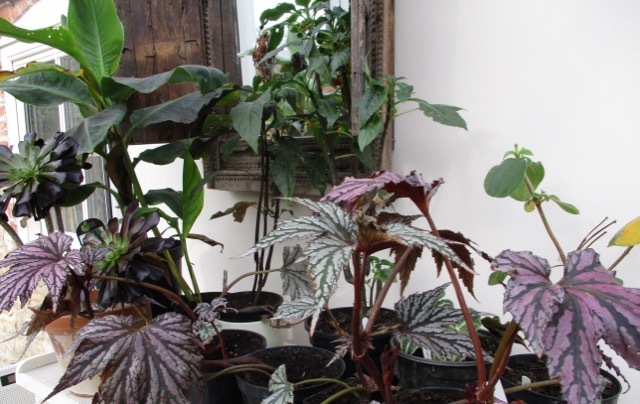 The Begonia 'Angels' have retained their foliage and still appear to be growing. 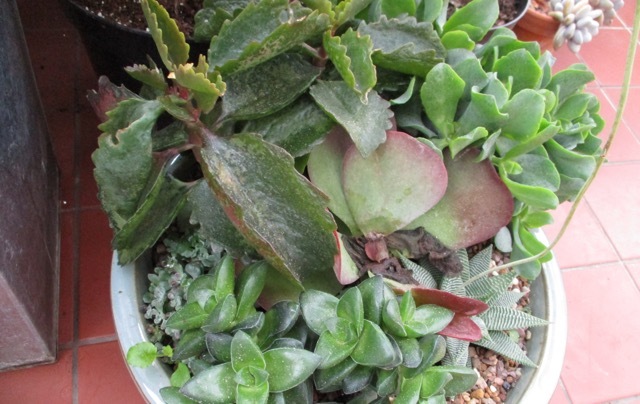 All succulents and cacti have been put into the smaller unheated greenhouse, which is kept ridiculously dry. 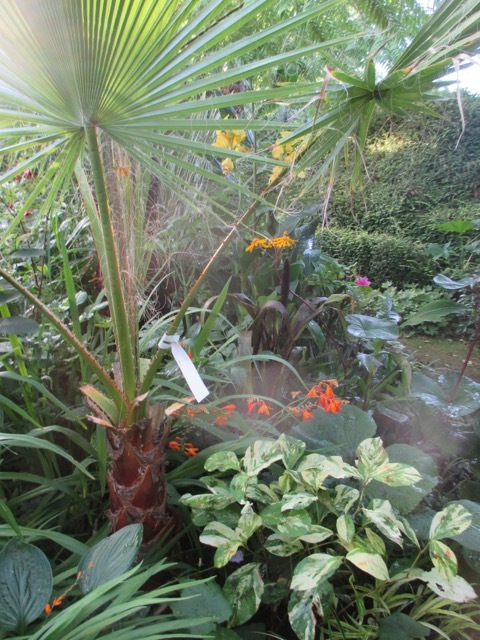 There is an Astelia in there which has actually survived for two mild winters outside, but I don't want to chance it again. 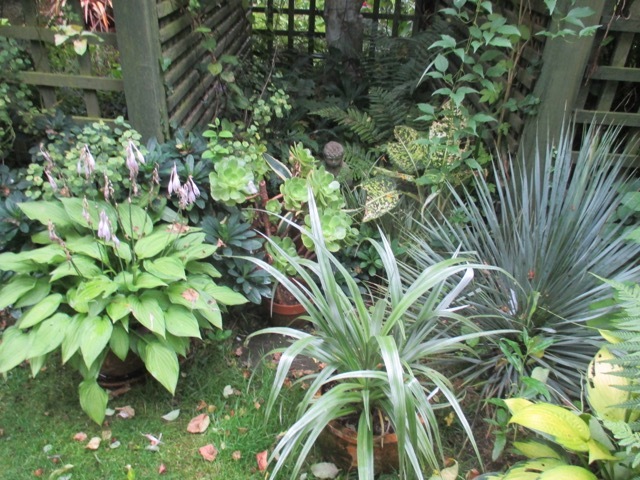 Also sheltering from the winter are agaves, aeoniums, aloes and yuccas. The theory is that they will be able to withstand the cold, as long as they are dry. 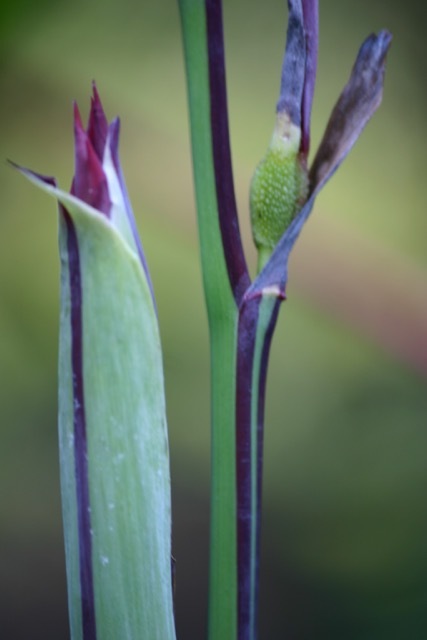 If allowed to suffer the dreaded combination of wet and cold then their roots will rot, and death will surely follow. In spells of exceptionally cold weather they can be covered with horticultural fleece. 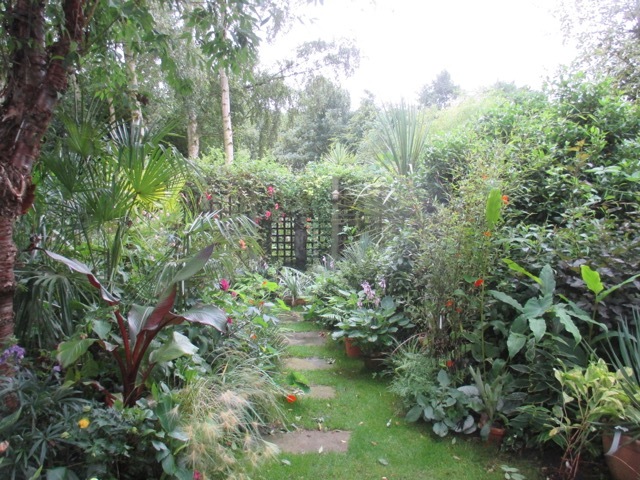 I will have to wait and see what this winter has in store for us, before I can measure the success of our new arrangements. We have already had some frosts and everything is still looking healthy. As a parting gift from summer, the Garden Gods have given us some clear, golden days so that we can squeeze out the last rays of hot sun. And so we have. 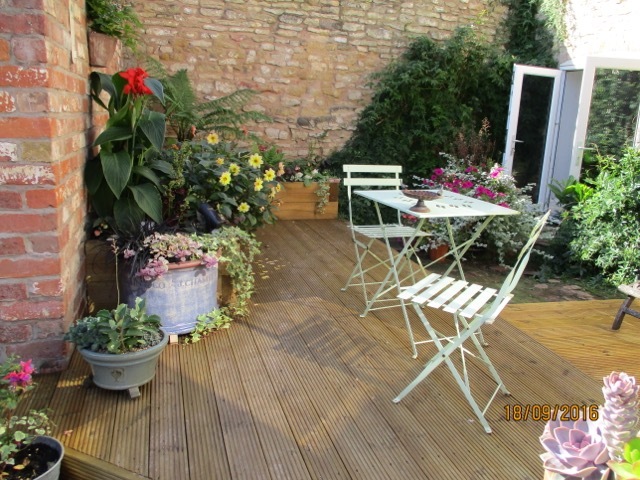 From breakfast outside to cold beers in the summerhouse at sunset, we have wrung out those rays and soaked them right up, so that the memory will help to see us through the leaden grey of November, and the gales of March. 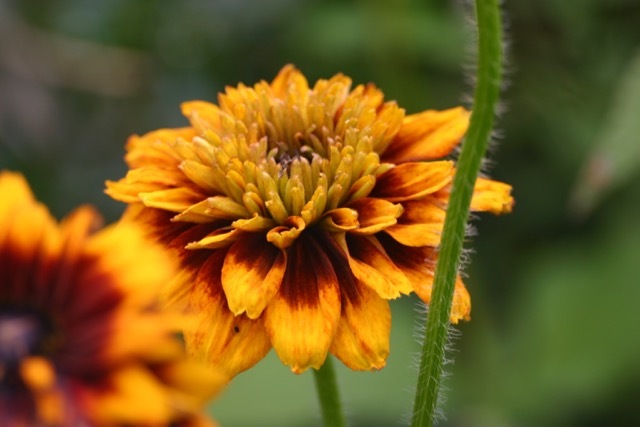 This September light has a mellow quality all of its own, gentle and golden, suffusing the garden and making the plants radiant and glowing. 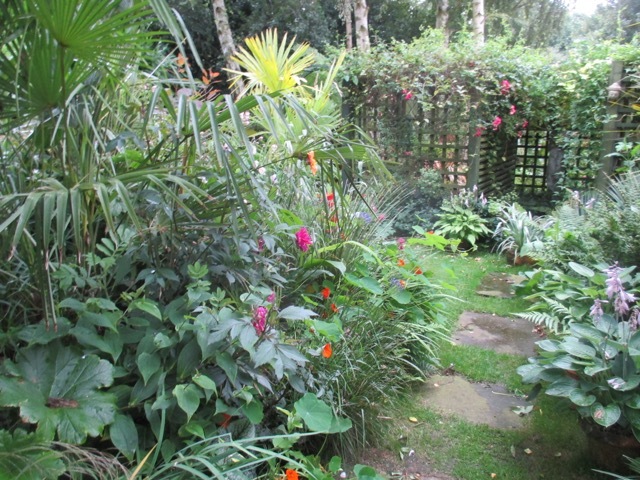 These glorious days were the ideal time to wander round the garden, to assess the success and otherwise, of this season. 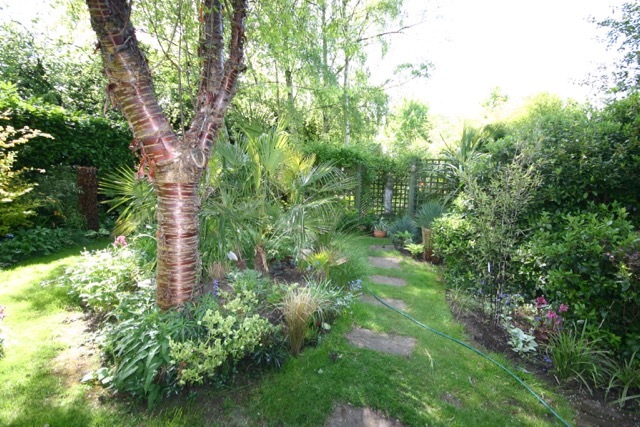 I think it probably looks better at this current point than in most other years, due to the long spell of good weather, which has provided ideal growing conditions. 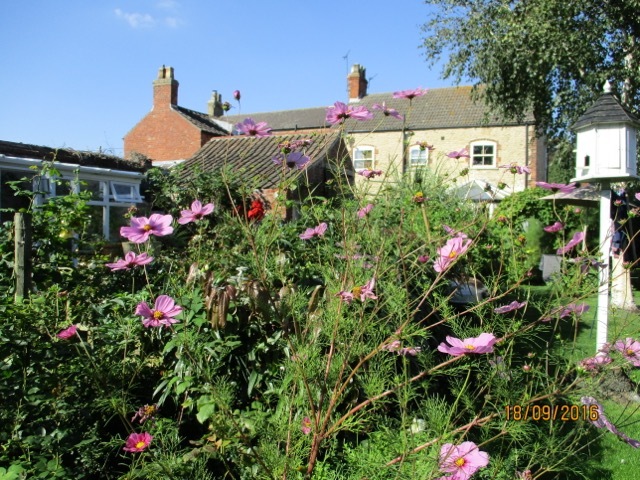 The plants have loved it and kept flowering and growing although some of the bedding has already been despatched as it has grown too leggy. 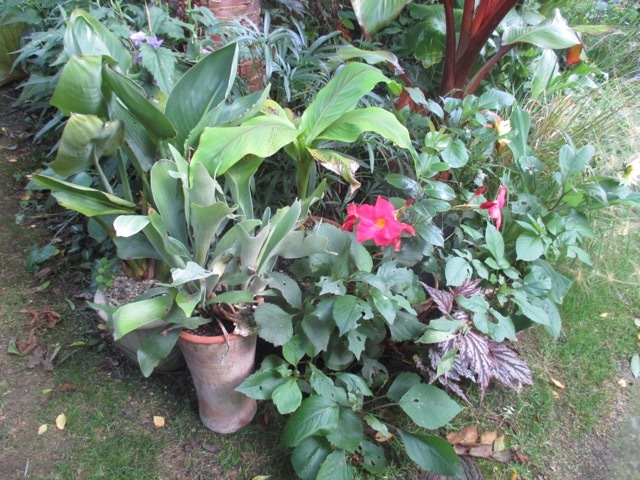 Most of the pots are still doing well, however, and providing lots of colour still. 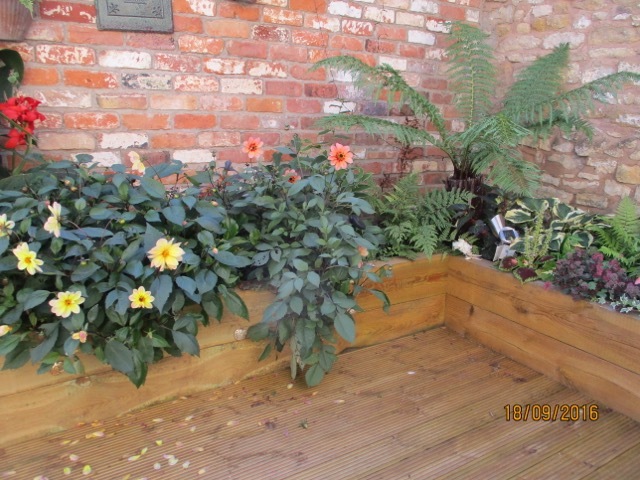 The new decking area planting has really filled out now, and the plants are very happy there. 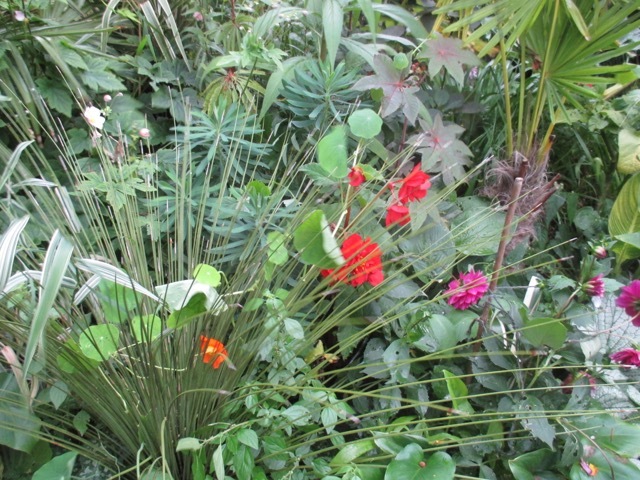 The dahlias and cannas have enjoyed the warmth of this protected area, warmed by the thick stone walls. 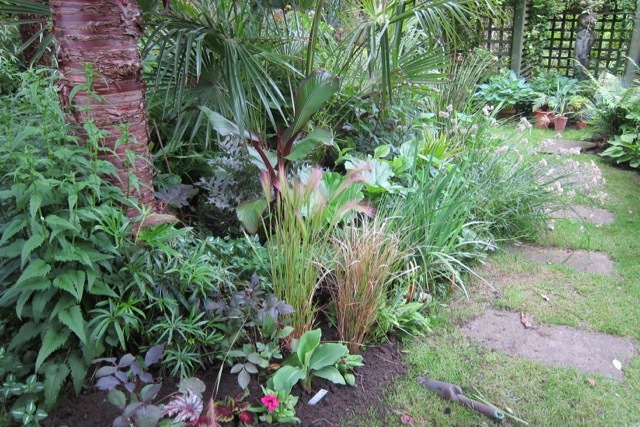 There is a ligularia and an astilbe right at the back which are not so happy, as the bed is very well drained, and so a little dry for their liking. 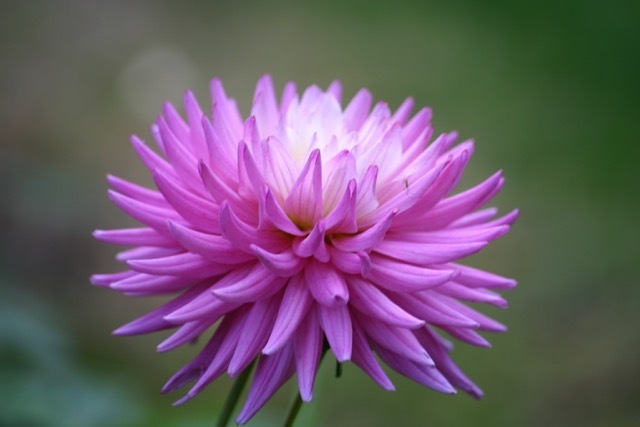 Although many of the garden stars have already played their part and disappeared until next year, many remain, meaning that the garden still has colour and vigour. 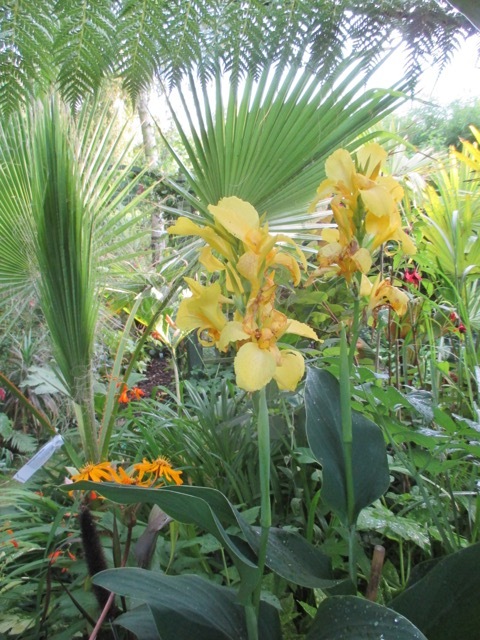 This is our first year with Canna 'Cleopatra' and what a showstopper it is ! 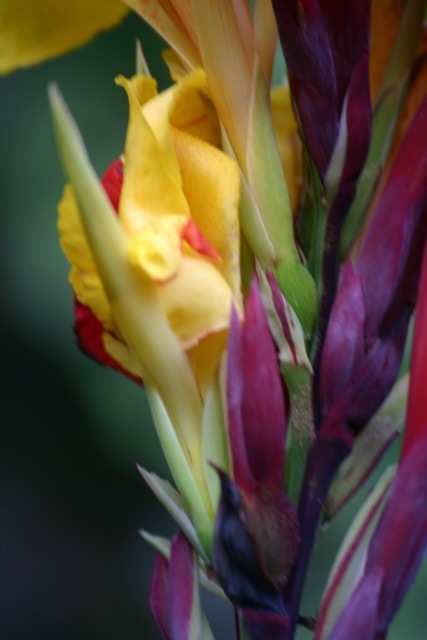 The flowers are a mixture of red and yellow, some being composed of a single coloured flower and some being a random mix of both. The foliage is a thing of beauty and has elegant stripes of dark chocolate. 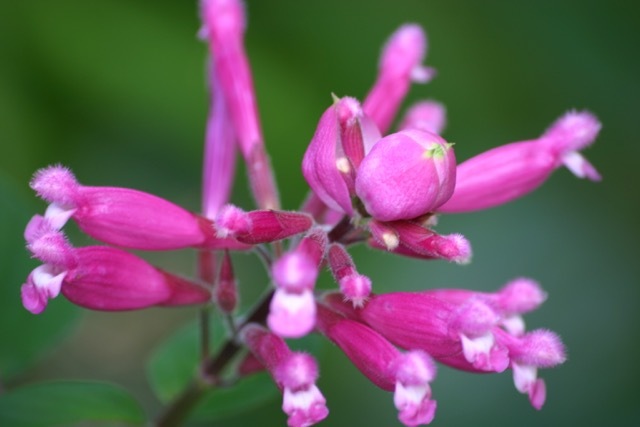 If you want muted and tasteful, this exuberant plant is not for you. 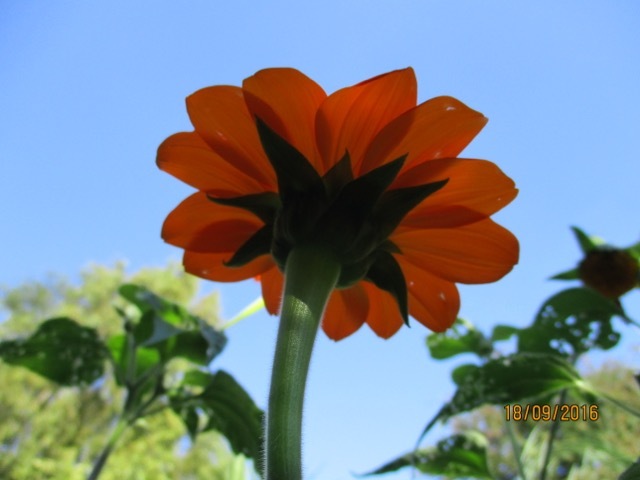 Ours is over six feet tall, and is no shrinking violet! 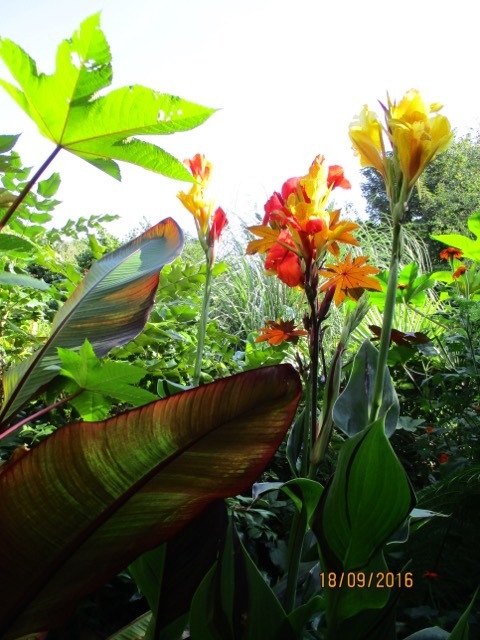 The photo above shows Canna 'Cleopatra', alongside banana 'Ensete Maurelli' and Ricinus (grown this spring from seed). 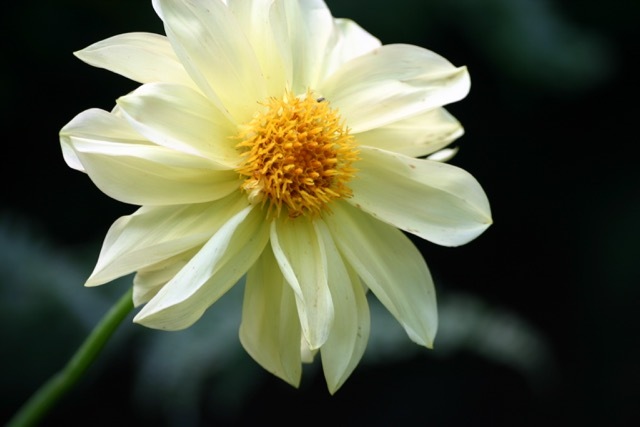 The garden is full of a number of varieties of dahlia, some named and others unknown, as they are our number one garden plant, giving non stop flower power until the first frosts. 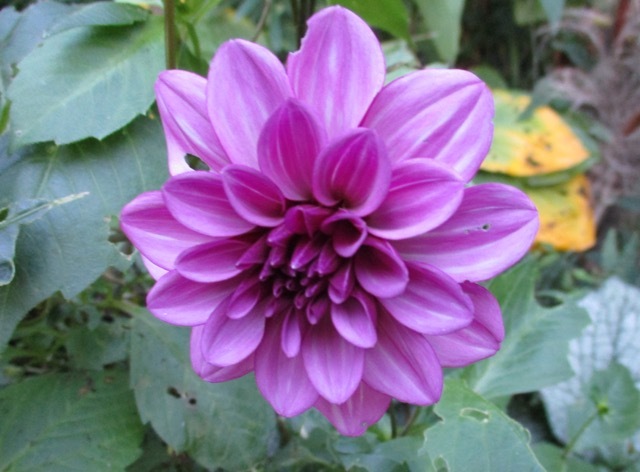 Below is one of the cactus dahlias , grown from seed this season. 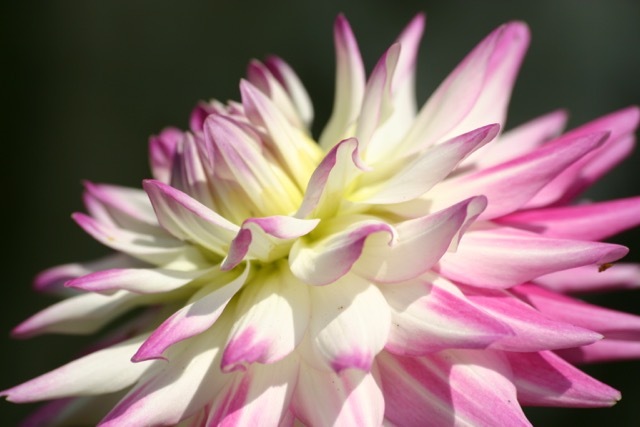 I love the slightly tousled, wildness of the petals. They grow absolutely massive, and are worth the additional efforts needed to stake them securely. 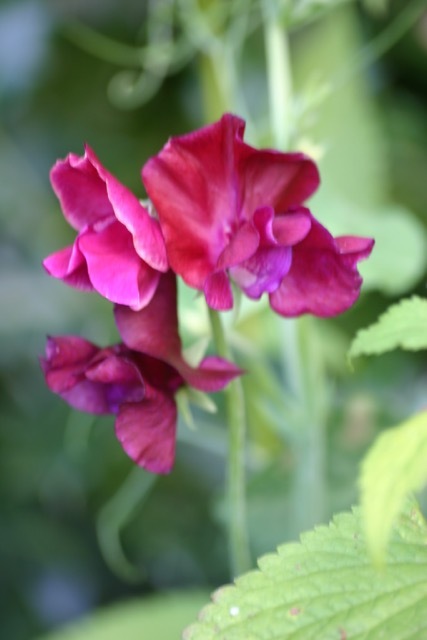 For me, this season has been my wake up call to Salvias - a wide ranging genus, ranging from hardy to definitely tender, but all bursting with colour. 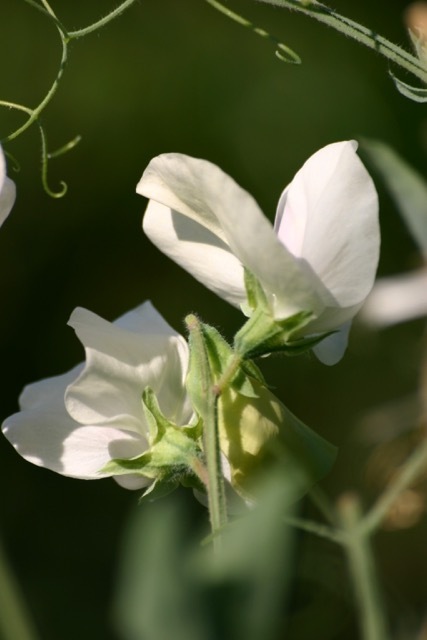 I am very drawn to the tender ones, and have been lucky enough to pick up a few on our visits to other gardens. 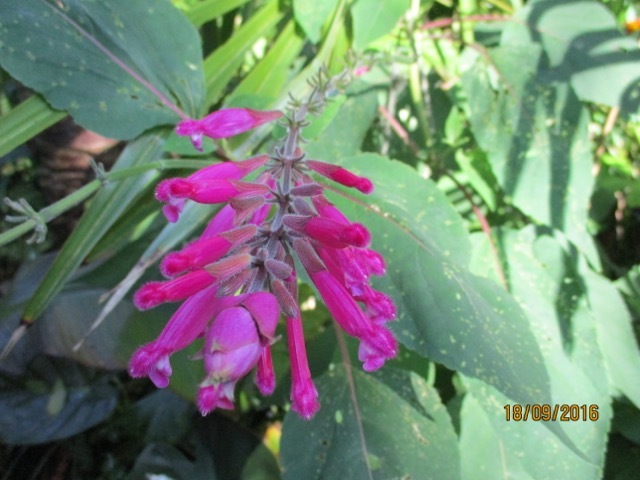 This is Salvia Involucrata 'Boutin', which flowers reliably and heavily from July to November. 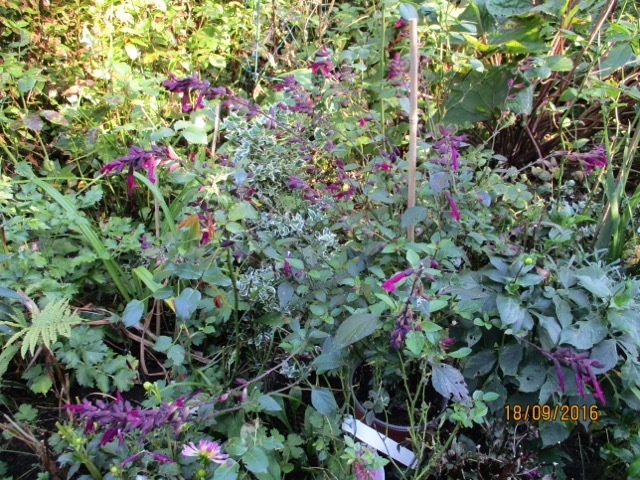 I assumed it was tender, but Dysons Salvia nursery report that it is hardy to -11 degrees with them. 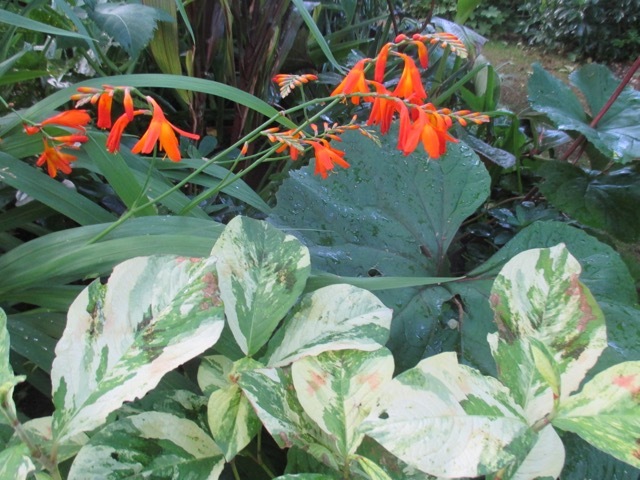 It has an AGM and I have found it to be an exceptional plant. 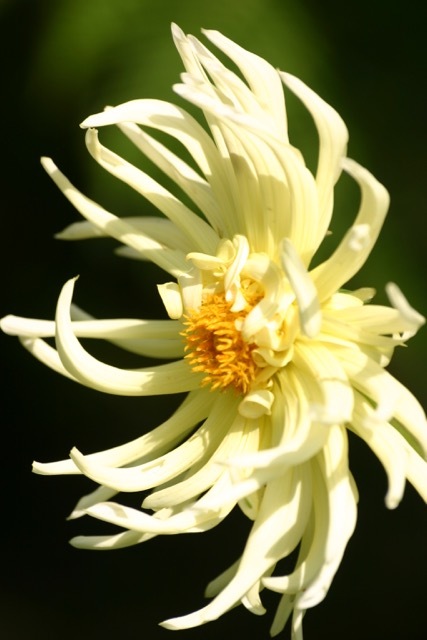 It roots very easily from cuttings, and I have taken lots, all of which have taken. 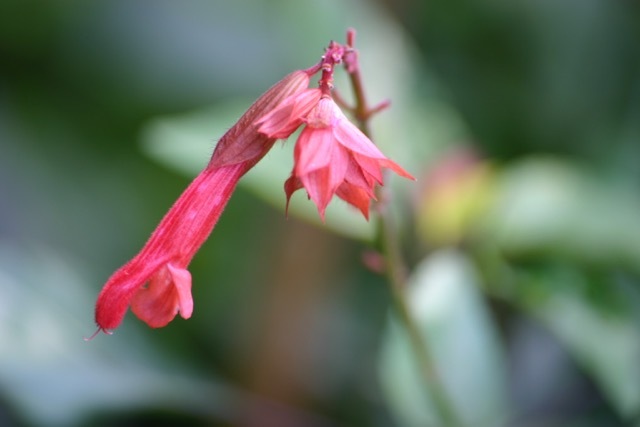 Below are photos of the most gorgeous Salvias going - the 'Wishes' series. 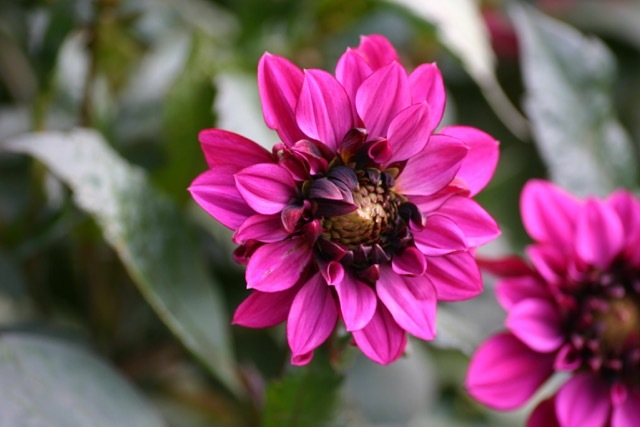 These are tender and need to be overwintered in a greenhouse. 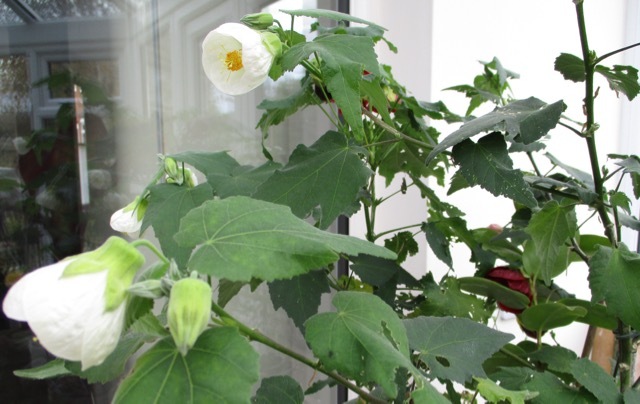 They may survive in an unheated one, but I plan to heat ours to a relatively high temperature to protect all our tender plants. 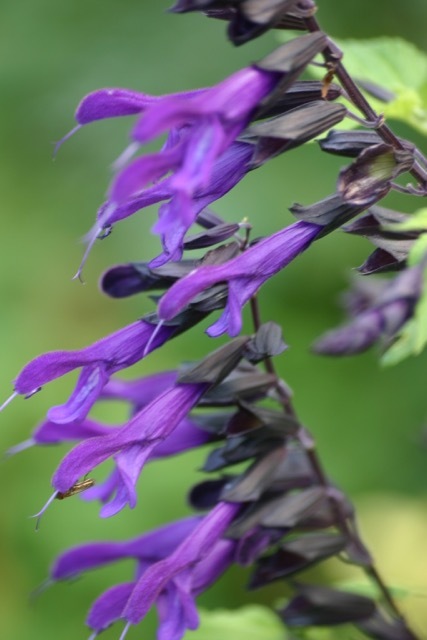 Above is Salvia 'Black Knight', a vigorous grower, and prolific flowerer, with quite a loose habit, common to all the 'Wishes' series. 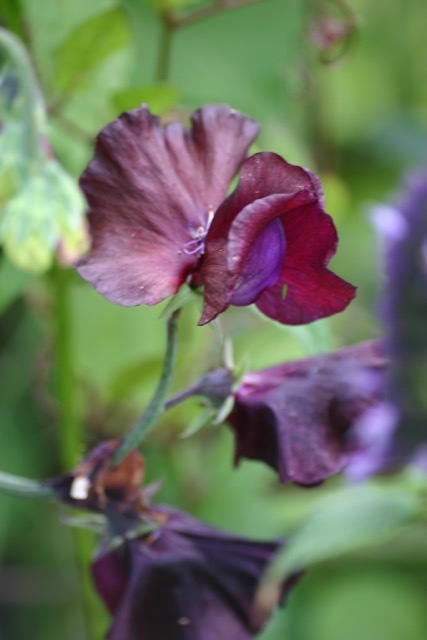 This is 'Embers Wishes', again a prolific flowerer, not quite as vigorous for me, as 'Black Knight', but still a great plant, and easy to take cuttings from. 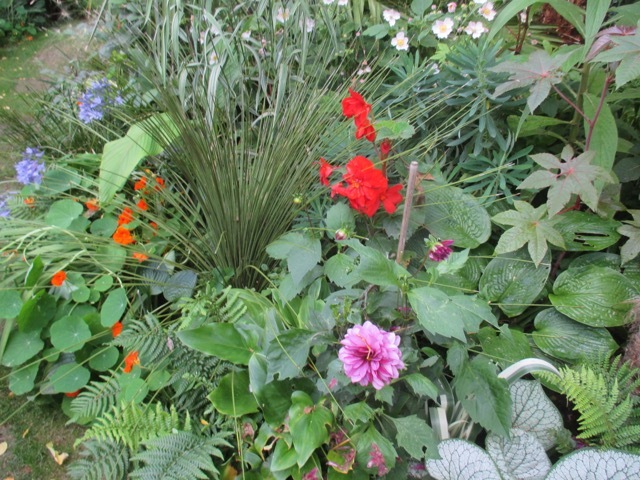 This is 'Love and wishes', showing how it likes to spread itself out in a mixed border. 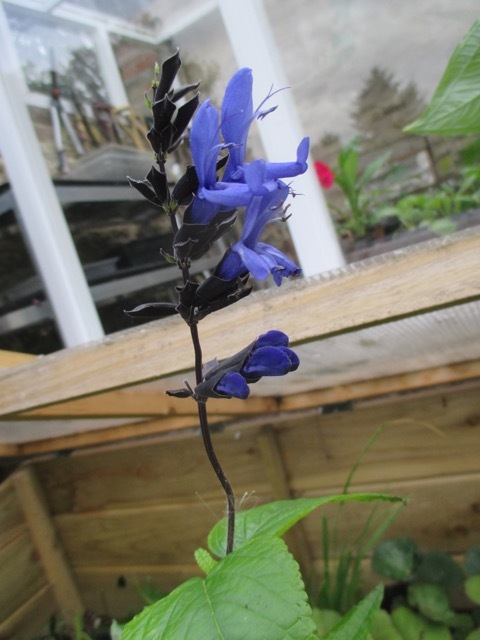 My personal favourite is 'Black and Blue', which has the same intense shade of blue as Salvia Patens, which contrasts so well with the black stems. Not pictured is 'Wendy's Wish', which I believe was one of the first in the series. 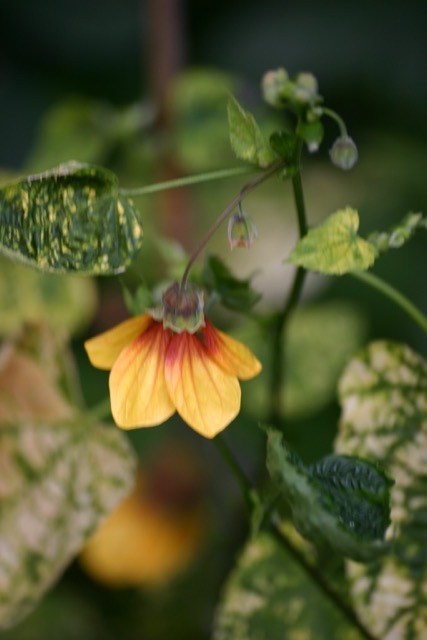 The Abutilons have also been a delight, and, as with the salvias, they are so easy to propagate by cuttings, with a very high strike rate. 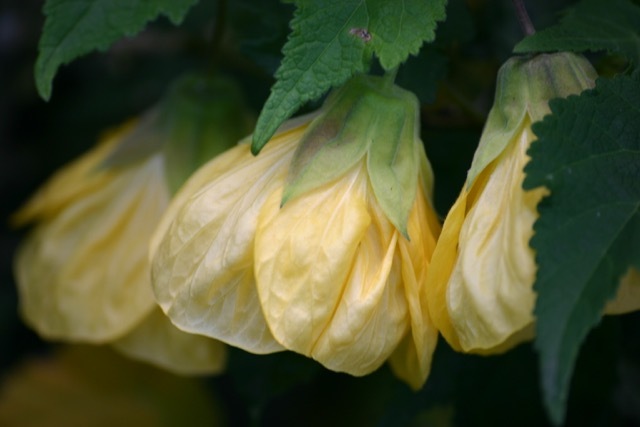 I guess the real disadvantage with Abutilons, for some people, is that the flowers are not as readily visible as many other plants, as the bell shaped blooms hang down, and are often half hidden by foliage. 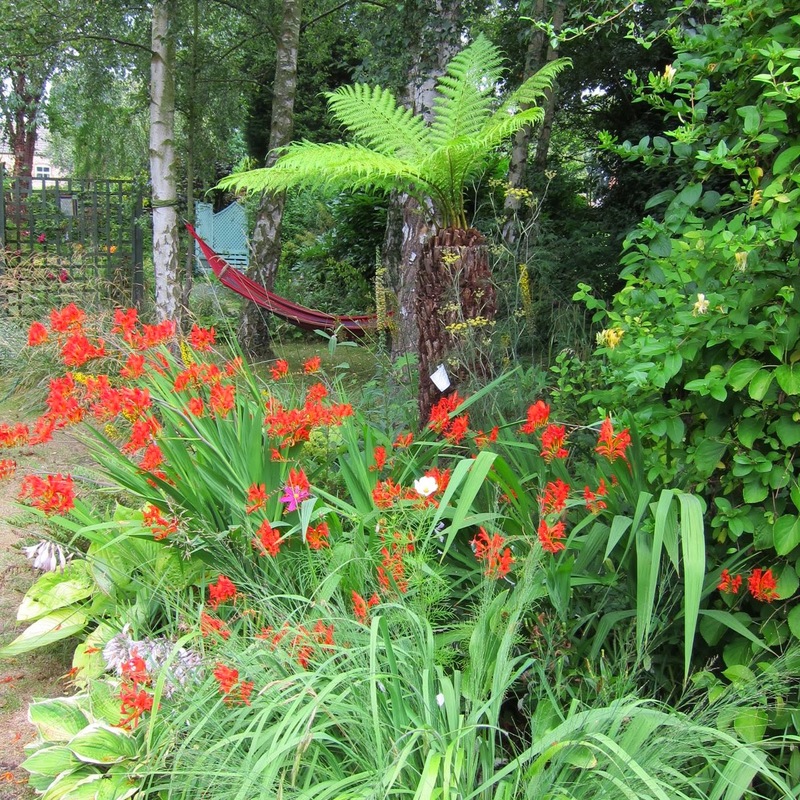 I quite like this quiet modesty, and I will grow them every year from now on. 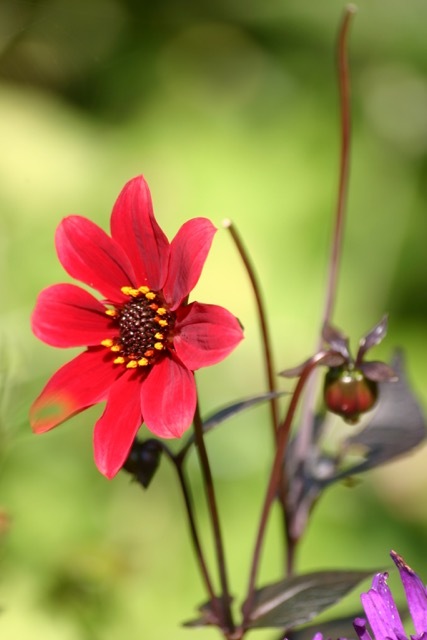 This glossy, strong red flower is probably my favourite, although there are pinks as well as the reds and yellows, all of varying intensity of shades. 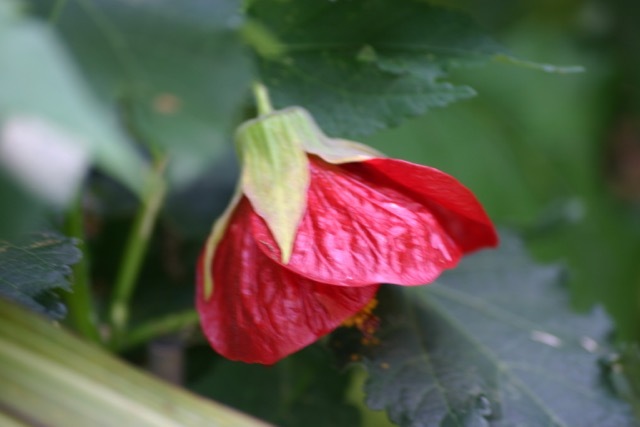 Abutilon 'Milleri Variegatum' has survived, but not thrived, in the garden this season. 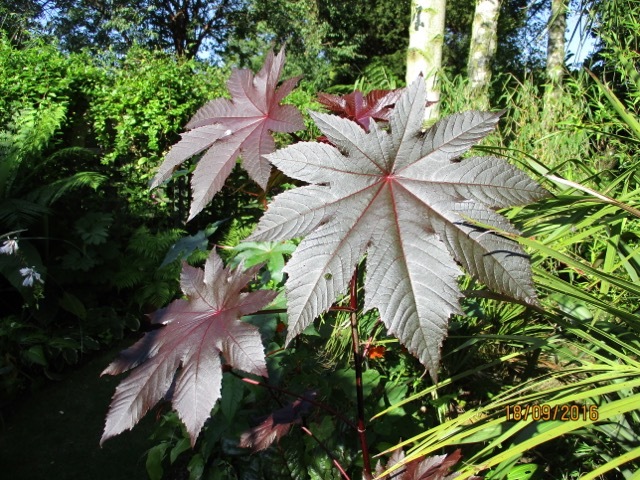 I was initially puzzled by this plant, which came into flower a couple of weeks ago. 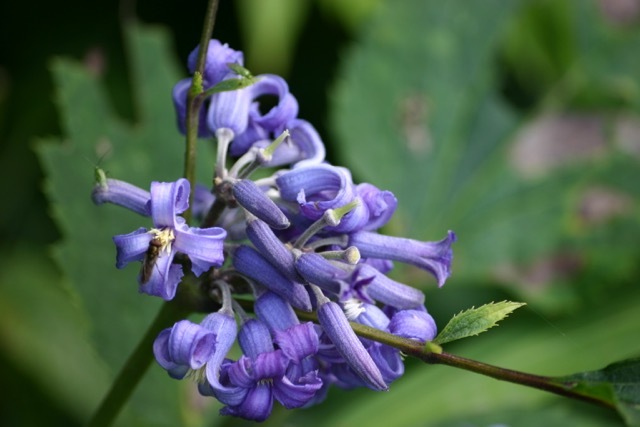 I couldn't identify it, and thought that the nearest match to the flowers was something akin to a hyacinth. 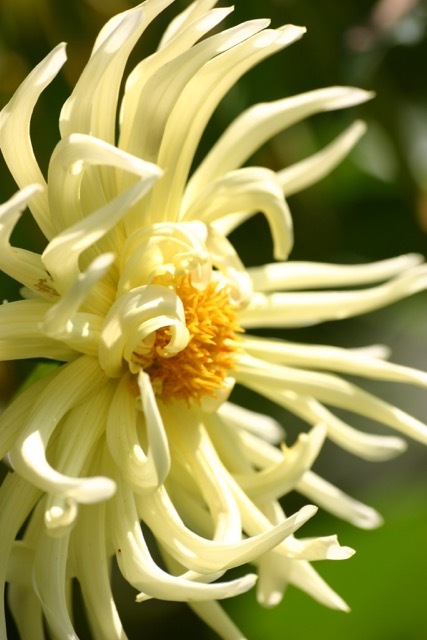 However, I came across it by accident on a website, and it is Clematis 'New Love'. 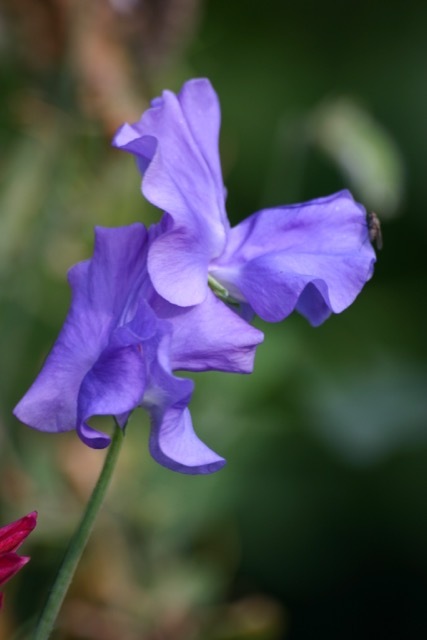 Not a climber, this is a shrubby perennial with large leaves, and these lovely scented blue flowers. 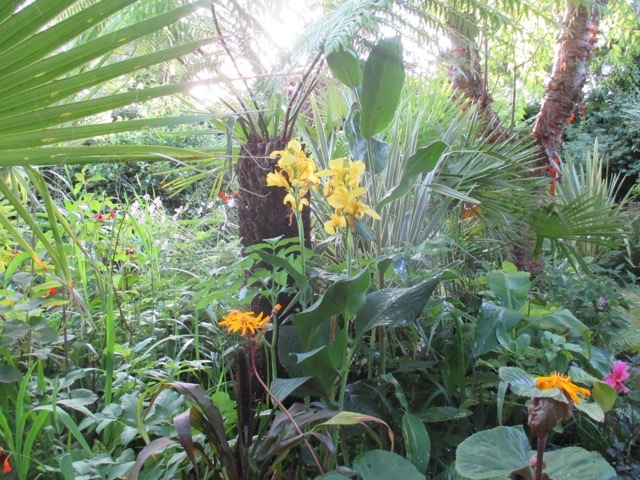 The Garden Gods are still smiling and sending some golden days, and each one seems like a gift.